The mouth is a very complex place. It houses a set of teeth, a tongue that is able to do so much and lips that keep everything together. We do so much with our mouths on a daily basis, it’s no wonder that they can become susceptible to certain issues at times. One of those issues is canker sores. 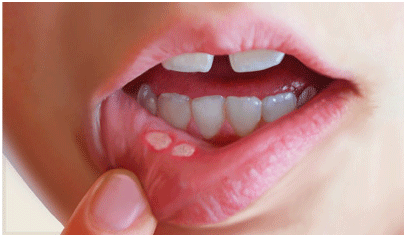 A canker sore is essentially a small ulcer that will show up inside your mouth. The two types of canker sores are simple and complex: simple canker sores can show up in the mouth at any given time and will stick around for about a week, while complex canker sores last longer and usually only appear in the mouths of people that have had them before. The good news is that they aren’t contagious and the pain and swelling from a canker sore will usually subside on its own after a few days. However in certain instances the aid of a dental professional may be required. They may prescribe an antimicrobial mouth wash or an over the counter solution that can be purchased at a pharmacy.